"Man in the Mirror (Michael Jackson Cover)"
Beverly Hills, 90210 他自己 單集："Forgive and Forget"
30 Rock 他自己 單集："Kidney Now!" Family Guy 他自己 配音；單集："Quagmire's Quagmire"
^ Interview: Adam Levine. The Jewish Chronicle. February 11, 2011. ^ 3.0 3.1 3.2 3.3 3.4 3.5 German Singles Chart: Adam Levine. acharts.com. [May 13, 2010]. 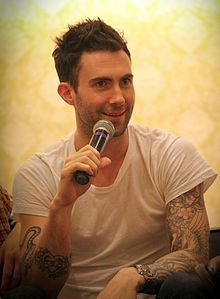 ^ Australian Singles Chart: Adam Levine. australian-charts.com. [May 13, 2010]. ^ Irish Singles Chart: Adam Levine. irish-charts.com. [May 13, 2010]. ^ Dutch Singles Chart: Adam Levine. dutchcharts.nl. [May 13, 2010]. ^ New Zealand Singles Chart: Adam Levine. charts.org.nz. [May 13, 2010]. Chart Stats – Kanye West. Chart Stats. [September 29, 2011]. （原始内容存档于2012年12月16日）. Bang Bang on UK Singles Chart. zobbel.de. [May 13, 2010]. Chart Log UK - New Entries Update 9.02.2013 (wk5). zobbel.de. [February 12, 2013]. ^ Yolo (feat. 亞當·李維 和 Kendrick Lamar) – Single by The Lonely Island. iTunes Store. Apple. [January 27, 2013].